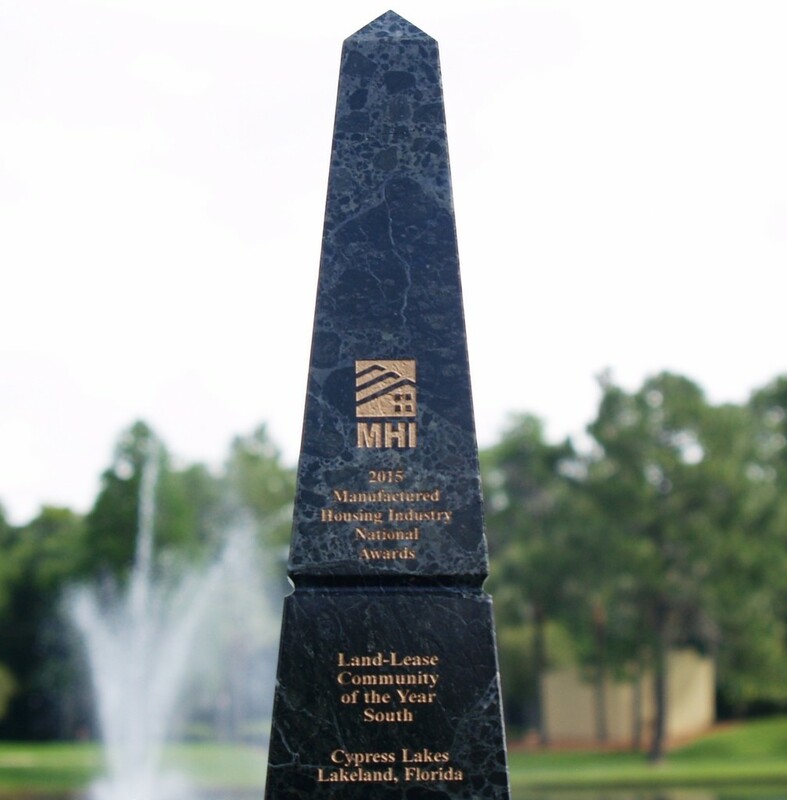 Lakeland, Fla. (April 21, 2015) – On Wednesday, April 15, Cypress Lakes, a Blair Group Community located in Lakeland, Florida was awarded Land-Lease Community of the Year by MHI, the national trade organization representing all segments of the factory-built housing industry. Communities were judged by an independent panel of planning, development, real estate, homebuilding and marketing professionals on the following: Community and industry involvement, aesthetics, site plan, lease and covenants, marketing materials, as well as a written summary. Awards represent the three regional areas of the US; Cypress Lakes 55+ Community was recognized for the southern region. “We at Blair Group are proud that our industry peers have selected Cypress Lakes as the ‘Number One, Premier Manufactured Housing Community’ in the southern US,” said Bob Young, President of Blair Group. Over 500 industry leaders attended the April 15 awards presentation in Las Vegas where Mr. Young and Cyndi King, Vice President of Operations for Blair Group, accepted the award. MHI is the preeminent national trade association for the manufactured and modular home businesses, representing all segments of these industries before Congress and the Federal government. From its Washington, D.C. area headquarters, MHI actively works to promote fair laws and regulation for all MHI members and the industry. For more information on MHI, visit www.manufacturedhousing.org.